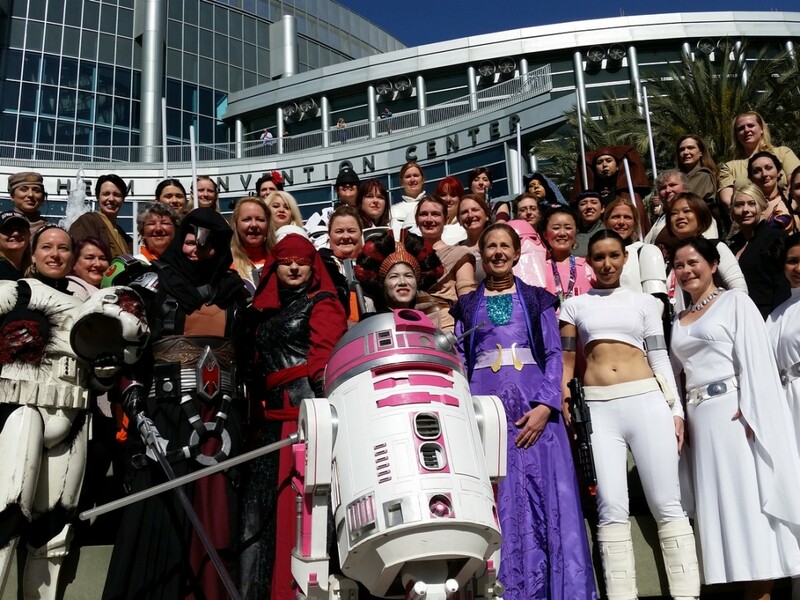 Star Wars has a rich legacy of firsts. 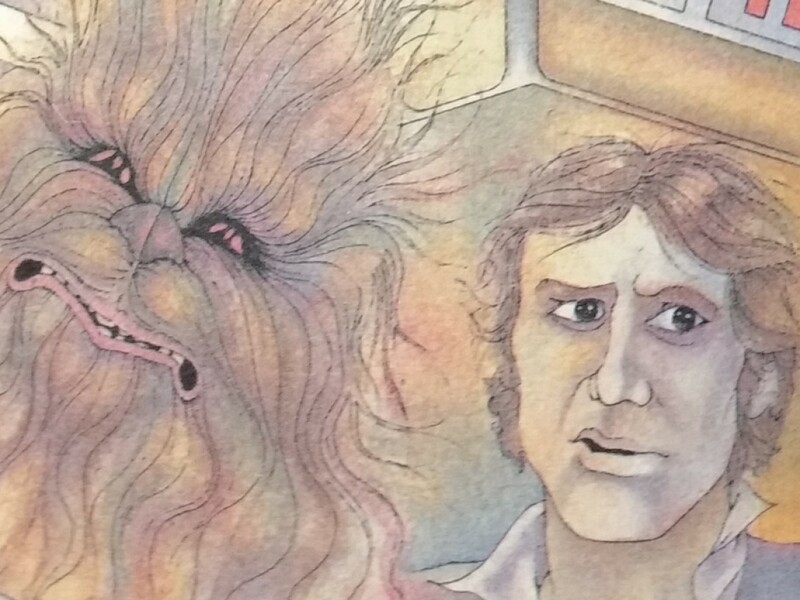 When it first came out in 1977, A New Hope was wholly different from any science-fiction story ever told and it broke the mold. Not only that, but it recast how the business of movies could be run by revealing the power of merchandising. 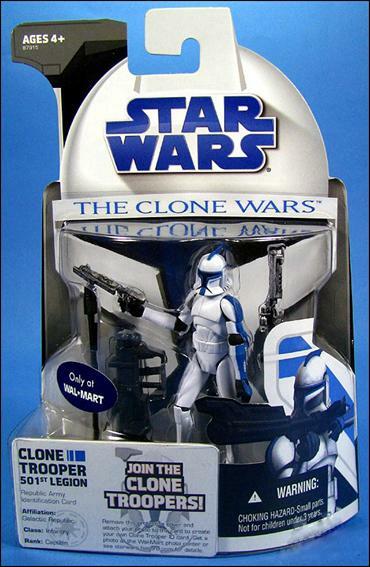 Nowadays every big kids’ movie has an obligatory toy line, but Star Wars was the first to see its potential. As a corollary to that, the 501st Legion was the first Star Wars fan club (or fan club of any franchise, really) to see itself plugged right into the product line of the very universe it sought to celebrate. It’s both exciting and humbling to witness. Here is a fictional universe that one man imagined and countless millions have enjoyed. 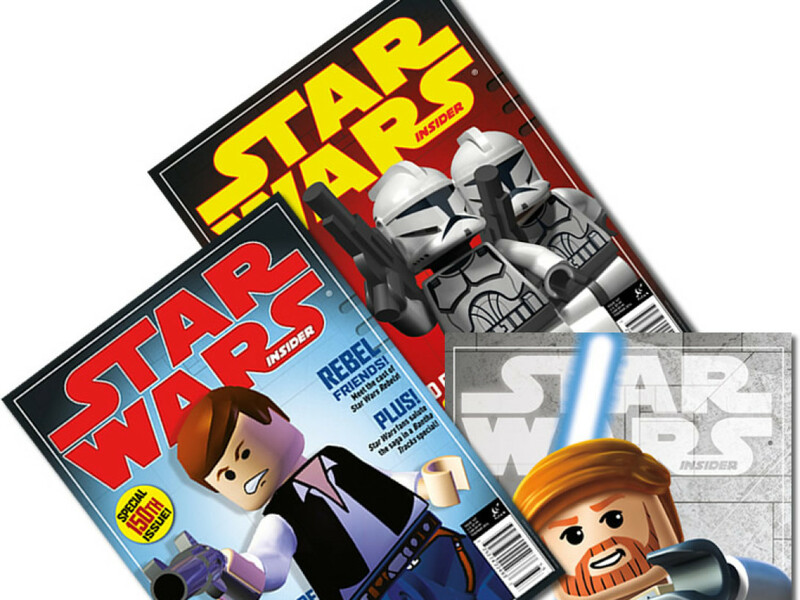 Thousands of artists, authors, and editors have contributed to populate it to George Lucas’ standards. But to imagine the fans themselves being welcomed into the canon is just inspiring. 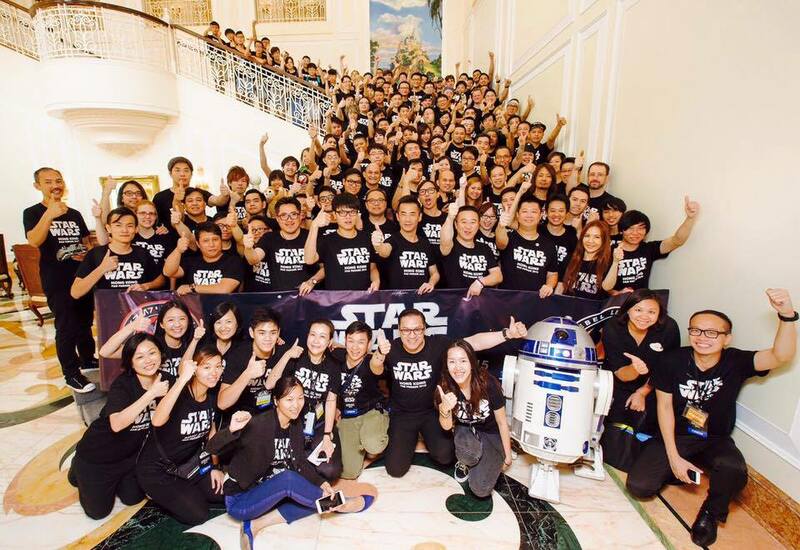 The story of how the 501st became Star Wars canon is a story for another blog. 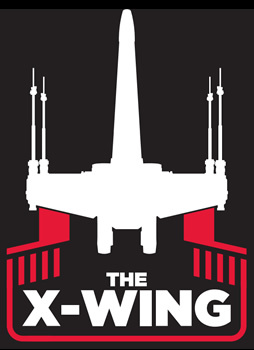 Since 2004, Lucasfilm has owned the rights to the 501st Legion name and I couldn’t be happier. Every so often I browse a toy store or a convention floor and out of nowhere there’s 501st merchandise for the offering. Wow. So here’s a quick and incomplete list of the cool items I’ve seen come out. If you’ve seen more feel free to contact me and we’ll add it to the list. 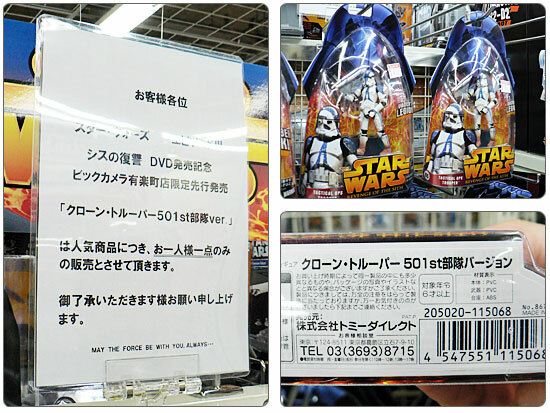 At some point in late 2005 / early 2006 a blue clone trooper figure appeared in Japan stores featuring the title “Vader’s Legion.” This may seem a coincidence, but the bottom of the package left no room for doubt: amid the Japanese lettering, it read “501” in the description. I can only guess they had not secured permission from us yet to use our name and found this description a good compromise. 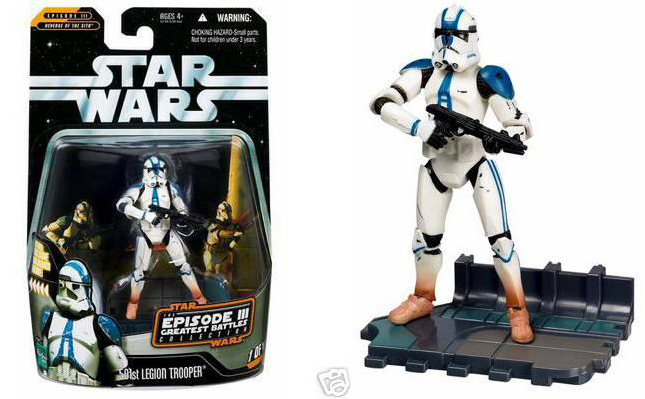 In July of 2006 Hasbro released a limited edition action figure featuring the 501st Legion Stormtrooper! The figure was an exclusive buy at Comic-Con in San Diego. 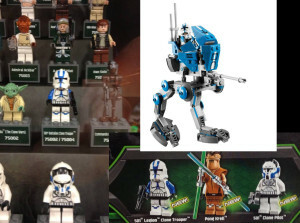 But Hasbro arranged for 501st members to get their hands on copies of the figure that didn’t include the Comic-Con signage. What made the figures unique was that it included a trading card inside featuring a fictional trooper, and the card’s layout design matched those of the Legion’s own first card series as designed by club merchandise officer Scott Will! 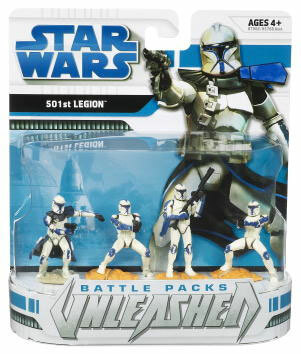 The card fit into a little slot in the back and could be removed and replaced with a regular Legion member’s card to allow them to personalize the figure to be them! How cool is that? 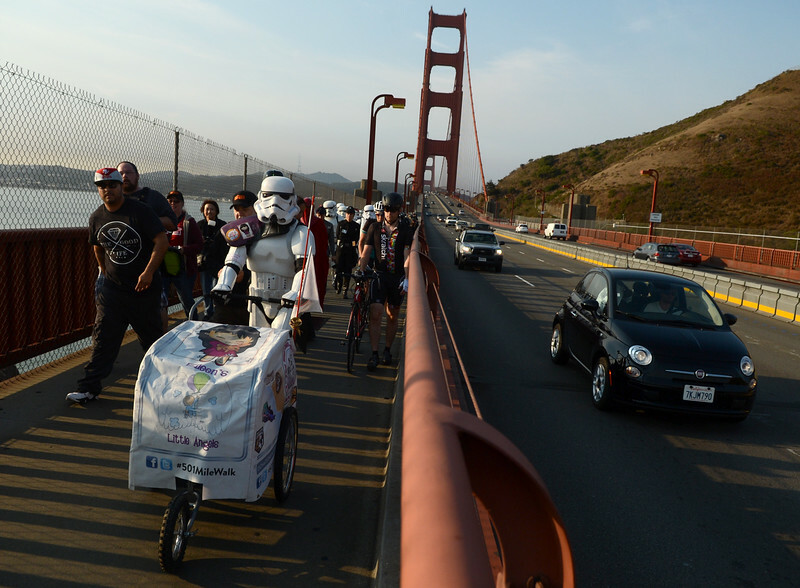 Later there were troopers who recreated the banner and stand inside the package so they could actually pose with it. This was very popular at the Rose Bowl Parade the next year! In August 2006 Hasbro released another 501st figure, this time the blue-striped clone troopers seen in Episode III. 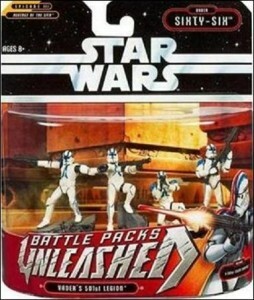 This was part of their Greatest Battles of Episode III collection. 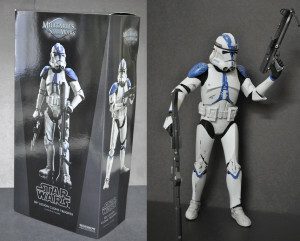 This was a nice touch, because not only did it tie the 501st with the scene in the movie with which we were credited, but it completed the connection between the clone troopers and the Stormtroopers — the 501st covered it all! 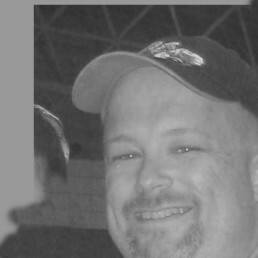 Much thanks to Darryl Depriest from Hasbro who helped make this a reality. 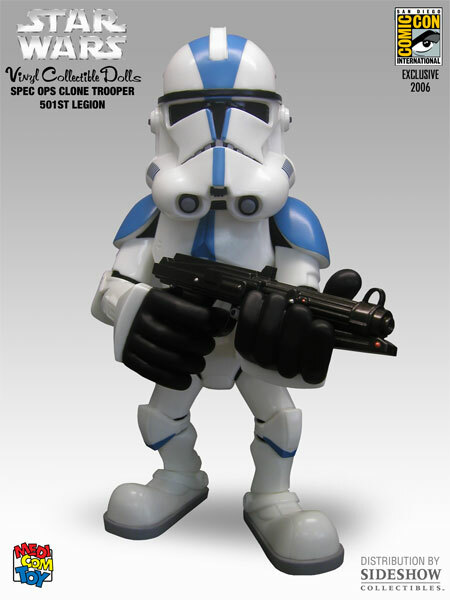 In 2006, Medicom Toy Corporation designed and produced a 501st clone trooper in their Japanese style VCD (Vinyl Collectible Dolls). 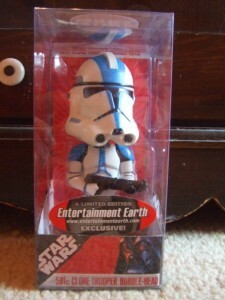 This limited edition bobble head was put out by Entertainment Earth at ComicCon 2007. My daughter Allie and I were at the convention and saw this in the dealer’s room. I marched right up and asked the dealer if I could see it up-close. The lady behind the counter gave me a funny look and said “Yeah, just don’t go running off with that.” Allie and I had a good laugh at that. I didn’t bother informing the lady that I had a vested interest in the product. I paid for it and left it at that. …and again in clone trooper form. This is a Star Wars: The Clone Wars 3 3/4″ clone trooper 501st Legion, Walmart-exclusive by Hasbro. They dropped the “Vader’s 501st Legion” and just made them part of the clone troopers. I think I prefer them being known as Vader’s soldiers. After all, that’s how the concept started. From Sideshow Collectibles’ Militaries of Star Wars line, a 1:6 scale 501st clone trooper figure. 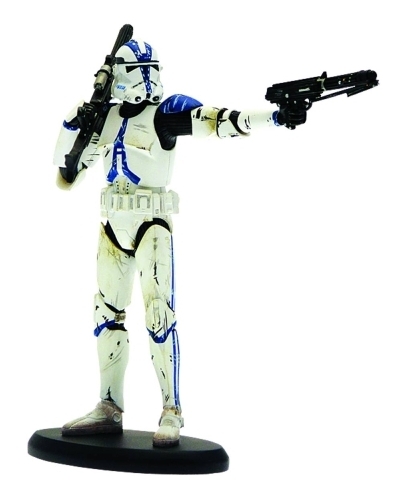 From Hasbro’s Episode III Greatest Battles: 501st clone trooper figure (Saga 2 Greatest Hits Carded Clone Trooper 501st C-9). 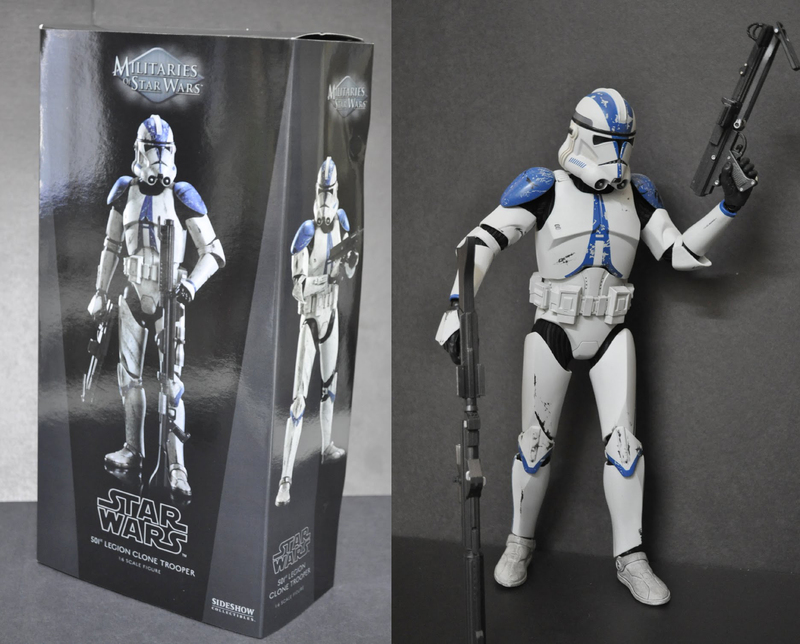 This import from France, a Star Wars 501st Legion clone trooper 1/10 scale resin statue, was limited in production to 1,500 pieces. And last but not least just last year when I thought a 31″ Vader was cool enough, lo and behold this beast appeared on the toy shelves! A 501st Legion trooper almost as big as my kids! I was geeking out when I saw this. 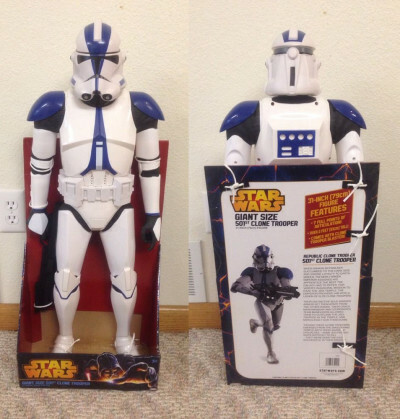 I’m sure there are PLENTY more 501st items out there. 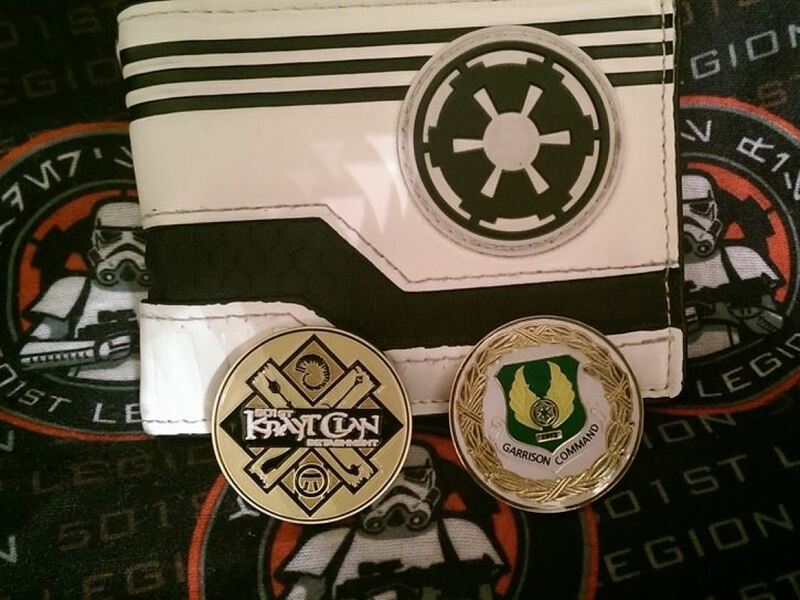 If you know of any and can provide details and photos I’d sure appreciate it and be happy to send you a Legion patch as a thank you. I try to keep up with it at the Legion Archives site but I know I’m way behind. 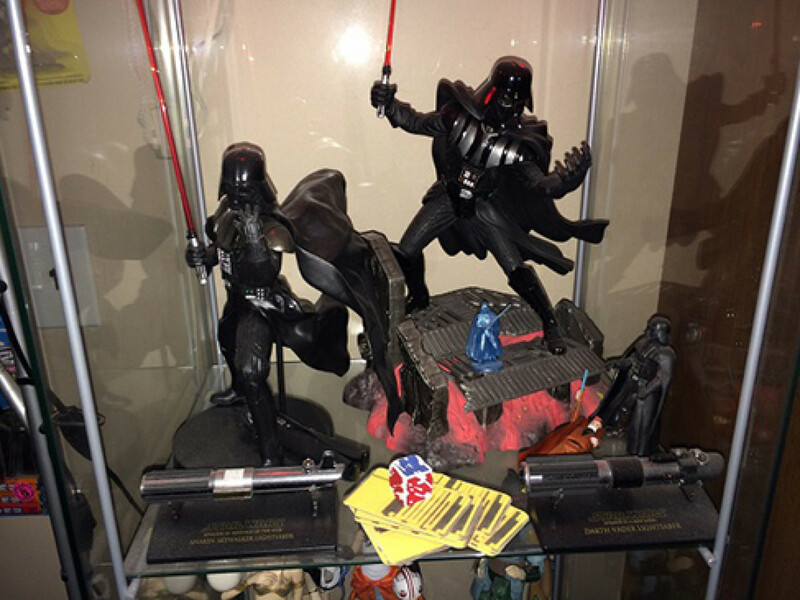 I am just amazed at what Lucasfilm did with a simple fan idea. 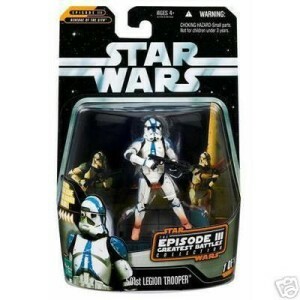 The Legion started out as nothing more than a cool idea I had for uniting fans under the banner of the Empire. It’s grown so huge that now I have kids coming up to me fully believing that the club came AFTER the movie and all the cool merchandise. Well, let them think what they will. The truth makes for a much more compelling story. And it always makes for a big smile on my face every time I go into a toy store and see one of my old buddies sitting up on the shelf, keeping the Star Wars section safe for the Empire.